I’ve started reading Weelicious by Catherine McCord. I know she is popular however I was not familiar with her books or site. I’m really enjoying her book and her recipes are easy and delicious. 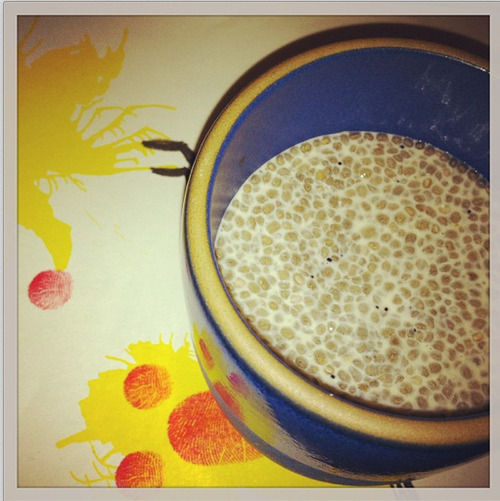 Although this recipe for Vanilla Chia Seed Pudding is not in the book I easily found it on her site while exploring chia seed recipes. Made it over the weekend -took mintutes and it was yummy. 1. In a small bowl, whisk together the milk, honey and vanilla. Add the chia seeds and stir to combine. 2. Refrigerate 4 hours, stirring once halfway through.